A 27MHz Ringo has been collecting dust in the shed for years, and after successfully constructing a vertical for 6 meters, it was time to put the Ringo to good use. The plan is to remove the ring and connect 4 x ¼wavelength radials for each band. The center of the SO239 connector is connected to the 5.3 meter driven element via a short piece of aluminum. The driven element is already a 1/4wavelength on 20 meters. A bracket was made from aluminum strip to bolt the radials to and was screwed to the existing earth bracket left over after removal of the ring. A 50mm x 500mm pipe is hammered into the ground leaving 200mm above the ground for the base of the vertical to slip into. Radials were cut from 2.5mm diameter aluminum wire scavenged from old power line cable. Initially the 10 and 20 meter radials were bolted to the earth bracket. A random length of RG58 coax was run from the antenna to the shack where a dip meter coil was screwed on. One would have thought that 20 meters would have tuned/dipped perfectly being a 1/4wavelength vertical. But not so. Adjusting the length of the antenna had no real effect on the reading of 18MHz dip. of coax was cut and terminated with PL259 plugs. This cable now dipped on the amateur bands and was duly plugged into the antenna. Hey presto, a perfect VSWR was obtained on 14MHz as expected. 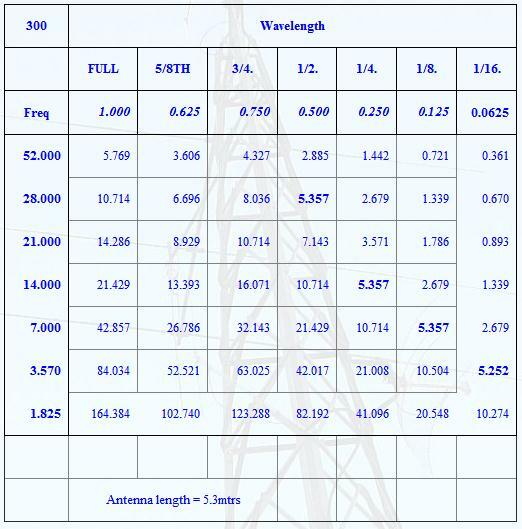 The length of coax cut is the only length of cable that is resonant on all HF ham bands. One could cut a single 1/4wavelength piece to match one band but the aim here was to use all bands with one vertical. Two radials for 7MHz were now attached and laid out across the ground. (The other two are yet to be cut.) 10cm of each end was bent down and pushed into the soil to hold them in place till a proper burial can take place. Further testing confirmed the entire 14MHz band was 1:1 and 1.4:1 on 6 meters. With the aid of an ATU, all other bands were tunable including 80 meters. Yet to add is 2 more radials for 7 MHz, and radials for 21MHz. It will be interesting to see what improvements, if any, take place once they are in place. The following table was used as a guide for measurements. Radials were cut using the measurements in the 1/4wavelength column. VK4 to ZL tests on 20mtrs were 1 to 2 S points lower from the vertical than the TH6DXX beam. Feeding the antenna with RG213 instead of RG58 would give better results due to lower line losses. At around 0510z I worked VK7XX and the vertical was 1 to 2 S points better than the beam. 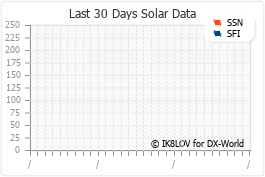 At 0530 the signal to VK7 was identical off both antennas. A VK3 joined the now expanding group and comparisons were 1 S point in favour of the beam. Seems polarisation must have played a role here. Tests returned good results on all other bands. In conclusion the ‘all band’ CB antenna with 1/4wavelength radials for each band surprised initial contacts on its performance and simplicity. It is small enough for confined spaces and the longer radials can be bent around if insufficient space exists to lay them out straight. After the success of the above antenna, I have now replaced it with a 40mtr 1/4 wave. The bottom section is made of 50mm square aluminum and the top half is light duty round 50mm. I had enough to make the full 10.3 meters in length. The bottom is hinged via a bolt through a 'u' shaped steel bracket. Another bracket on top of the post is used to hold it in place. Hoping for lots of rain to soften the topsoil so I can bury the radials. Above picture shows the radials completely buried. Yep, the grass is dead due to drought! I didn't have a full length of 10.3mtr aluminium so I improvised using one 2" square heavy walled piece, one thin walled 2" round that just didn't make the height, so then I tek screwed a smaller piece to it. All this was laying around collecting dust and dirt, so it was good to put it to use. It looks like crap but it works a treat .Ugly balun added 28/11/09. I removed it soon after, replaceing it with a 7 turn RG58 coil on a 50mm diameter plastic pipe. The vertical tunes better on other bands now.